Did the period of strong economic growth between 2005 and 2013 change the structure of employment in the country? The answer from the Sixth Economic Census is: precious little. It did not result in better, safer, more secure or more productive jobs for the masses. For instance, we would expect a shift away from rural to urban India, as workers find new opportunities in towns and cities. But the share of enterprises, or “establishments" as the census calls them, in urban areas went up only a smidgeon, from 39% in 2005 to 40.52% in 2013. The pace of change has been glacial. 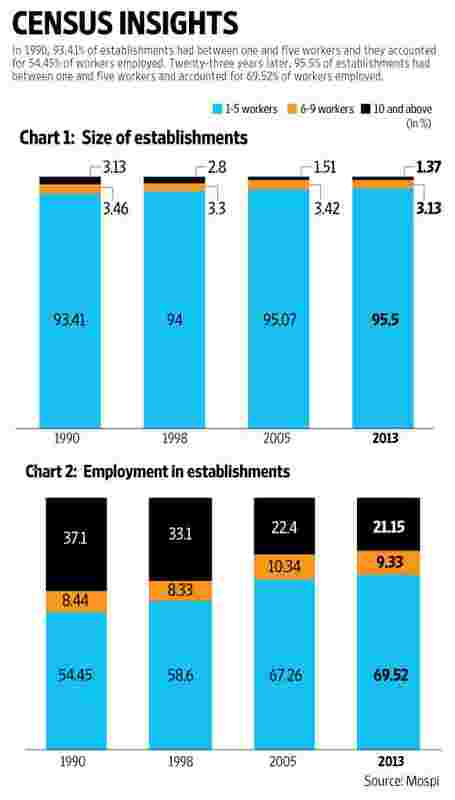 What’s worse is the share of employment in non-agricultural establishments fell from 89.18% in 2005 to 82.57% in 2013. The blueprint for economic development, the route out of poverty for developing nations, is one of a steady increase in jobs outside agriculture that not only cures disguised unemployment in farms but also results in higher productivity. But the economic census numbers tell a very different story. In spite of record growth rates in the economy, the share of non-agricultural employment fell between 2005 and 2013. That is not a healthy trend. In 2013, 31.01% of the total rural employment was in agricultural establishments and the remaining 68.99% was in non-agricultural establishments. So the proportion of workers in agricultural establishments in rural India has increased, while the proportion working in non-agricultural employment has declined. What was the main work in these “agricultural establishments"? It was taking care of livestock. It doesn’t speak much about rural diversification. Nor has there been any change in the very small size of the average Indian enterprise. Indeed, the share of minuscule “establishments" has become higher. In 1990, for example, 93.41% of establishments had between one and five workers and they accounted for 54.45% of the total number of workers employed. Twenty-three years later, 95.5% of establishments had between one and five workers and they accounted for 69.52% of the workers employed. It’s well known that the small size of Indian firms is a major reason for their abysmal levels of productivity. But employment in establishments employing more than 10 workers has steadily declined from 37.1% in 1990 to 21.15% in 2013. The average employment in a non-agricultural establishment with at least one hired worker fell from 6.40 in 1990 to 4.54 in 2013. The trend is towards an increase in very small firms. That doesn’t augur well for growth in productivity. Studies have shown that the share of micro and small enterprises in manufacturing employment is 84% in India, versus 27.5% for Malaysia and 24.8% for China. There’s other evidence available. In 2005, 35.41% of workers were in what the survey calls “own account establishments" or businesses that didn’t have a single hired worker. In 2013, that percentage had shot up to 44.29%. It’s likely that the vast majority of people in these “own account establishments" barely make ends meet and would grab the opportunity to get a decent job. Many of these so-called establishments would be street corner banana sellers. They’re part of the 18.44% of establishments that operate without a “fixed structure". Another 36.19% of all establishments are home-based and only the remaining 45.37% operate outside the home and have a fixed structure. That isn’t all. In 2005, 5.3% of all establishments were not permanent, but seasonal in nature. In 2013, that proportion edged higher to 5.9%. What financing can these home-based and “no fixed structure" establishments command? What technology can they use? What levels of skill or management acumen can they develop? How can they ever scale up? The best illustration of the kind of growth in employment we’re seeing is that of all the states, Manipur—a failed state plagued by multiple insurgencies, where government control over large parts of the state is tenuous—holds the record in employment growth between 2005 and 2013. It’s not hard to imagine the kind of “employment" that people have to take up in order to survive. The fact of the matter is that, in spite of the high GDP growth recorded during 2005-2013, the informalization of employment increased during the period. The vast majority of workers continued to scrape out a precarious living from dead-end jobs and the proportion of such workers has increased. The numbers show the problem has only become worse. A vast number of young people join the workforce every year, with millions deserting small and increasingly unviable farms for jobs in industry or services. This new generation, everybody tells us, is very “aspirational". Will they tolerate, as their parents did, being stuck in “home-based" and “no fixed structure" employment? Will they tolerate the increasing inequality between their bleak existence and the high-paying jobs in the formal sector? If they don’t, the demographic dividend is likely to become a demographic nightmare, with widespread social unrest.